When was the last time you left something in the oven for too long? Something where timing really matters, that is. I don’t mean slow-roasted shoulder of pork or a melt-in-the-mouth stew – dishes which work well with the odd inattentive slurp and stir every half hour or so – I’m talking food that is measured in minutes, where ‘too long’ can result in a complete catastrophe and clouds of smoke billowing from the cremated contents of your oven. Cakes and cookies, biscuits and bread – let’s face it, pretty much all baked goods – fall within this category; just a few minutes too many can mean the difference between a feather light sponge and piece of cardboard, a lovely loaf and a lump of lead. The best example I’ve ever seen of something being left to bake for too long involves my Mum and a (now infamous in my family) hot cross bun. When I was little, we’d often have rolls for breakfast on the weekend. Rather than putting them in the toaster we’d warm them in the oven; the bread stayed soft but the butter would melt instantly on impact, making a simple yet indulgent change from the usual toast of the working week. Sometimes we’d branch out – croissants from the local bakery if we were feeling fancy or special seasonal produce such as hot cross buns, but only a few weeks either side of Easter. You might see where I’m going with this story when I tell you that the hot cross bun in question was discovered at some point during the Christmas holidays . . .
Light fluffy burger buns . . .with slightly more crust than intended! I’m not sure why it took so long for us to find, or why we hadn’t smelt the scent of singeing dough in the months that passed, but the hot cross bun remained undiscovered for a very long time. When we finally found it, hidden away at the back of the oven, this little Easter treat was completely black but perfectly preserved, Pompei-style; a charcoal replica of itself complete with the neatly piped cross still intact on its top. Every time we turned the oven on it must have baked just that little bit more, slowly enough to solidify rather than disintegrate or burst into flames, and retaining its exact original structure. It looked quite cool. In fact my Mum thought it was wonderful in such a strange way that she kept this funny little specimen for years and years; it’s only fairly recently that the blackened bun has been relegated to that big bread basket in the sky. What happened to me this weekend isn’t quite up there with that bun on the cremation scale, but it was a real reminder of how important careful timing in the kitchen can be. I tend not to rely on a timer when baking, using my eyes, nose and our oven’s built-in clock to guide me through the process, but I’m starting to recognise that sometimes a few insistent beeps could be exactly what I need to bring me back to reality and keep my timing on track. 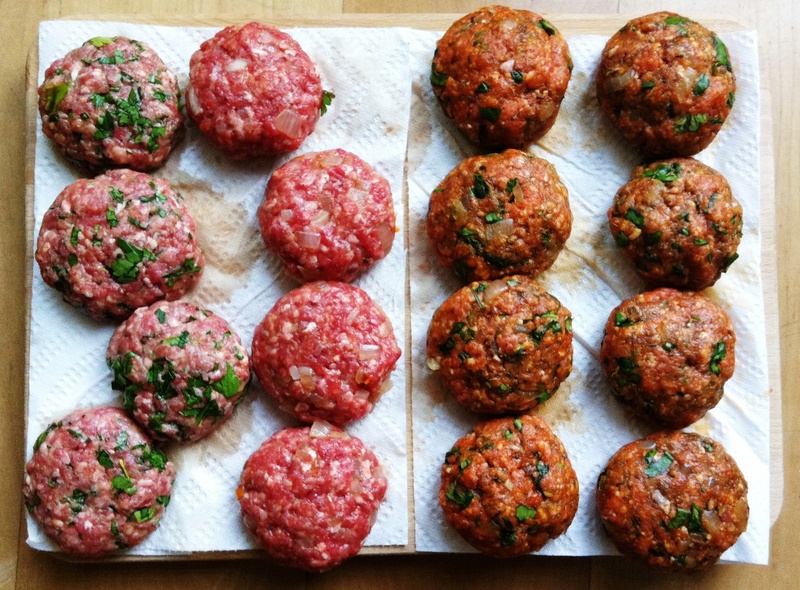 I made these buns for a BBQ on Saturday – I’ve already expressed my thoughts on the importance of bread at BBQs here – and decided to make them in mini form so we could have some fun with different flavoured sliders. Adapting a Dan Lepard recipe, I made and proved my dough before sliding two trays of beautiful sesame-seeded buns into the oven. It was then time to turn my attention to the rest of the meal – beef mince flavoured with two different rubs, coriander and cumin spiced lamb burgers, salads, sides and all the exciting accompaniments required to enhance the various flavour combinations on offer (homemade mayonnaise, garlicky raita, a spicy salsa etc etc). It was only half an hour later – burgers on the grill, drinks and crisps on the go – that I suddenly remembered my buns. That’s right. My fifteen-minutes-in-the-oven-if-they-were-twice-the-size-that-I-made-them mini slider buns. A fair amount of drama ensued, mostly involving me declaring the buns to be ruined and threatening to throw them all in the bin. Luckily sense (aka Carnivorous Boyfriend) prevailed, and we split one (surprisingly good to look at, and luckily not burnt) bun open to reveal a lovely soft middle. Flecked with pieces of melt-in-the-mouth onion, the dough had proved remarkably resilient, and athough the outside was a lot darker and crispier than I’d intended for my lighter-than-air burger buns, they actually tasted good. Really good. Against the melting meat and punchy sauces, their crispy crusts held their own, the centres still soft enough for that fluffy burger bun experience but with a little added texture. I’m aware that I began this post with a word of warning about cooking times, only to bulldoze in with a batch of buns which were baked for double the suggested time and still tasted delicious. Perhaps not the best way to prove my point. But nobody’s perfect, and neither were these buns. I loved them, they were delicious, but I think in their intended form and if you halved the baking time they could potentially be twice as nice. Unless you’re Heston, there’s always going to be room for improvement, and sometimes making mistakes is the only way to truly learn. Next time I bake these buns I’ll be sticking on my brand new digital timer. I’ll probably still rely on my nose, give them a few minutes more or take them out just before the timer pings (if I remember), but at least I’ll have that safety net to rely on, to remind me of what’s going on in the kitchen if I’m otherwise distracted and help me get that one step closer to the perfect burger bun. What’s the biggest baking catastrophe you’ve ever had? Did you manage to salvage it? And do you always rely on a kitchen timer? Sweat the onion in the oil over a medium heat until very soft, translucent and tender, with all of the moisture gone. Set aside to cool. Mix together the yoghurt, honey and egg. Add the cooled onions then pour in 125ml warm water and the yeast, mixing well. Add both flours and the salt then start mixing to form a dough. You’ll need to add a little more water at this stage – around 50ml but slightly depends on how soft your onions are and how much water they have retained so add a little at a time until you achieve a workable texture. Set the dough aside for 10 minutes, covered with a tea towel. When the time is up, slide your dough onto a clean worksurface and give it a quick 10-second knead. Return it to the bowl, cover and leave for another 10 minutes. Repeat this knead-and-leave sequence twice more, before finally leaving the dough to rise undisturbed for an hour. Divide the dough into sixteen equal pieces for fairly small buns, 24 if you’re going for canape-style sliders. Shape each into balls, tucking the edges into the middle, then flatten slightly. Brush the tops with water, roll in a plateful of sesame seeds so they stick well, then place on a couple of baking trays lined with nonstick baking paper (making sure to leave a little room in between each to allow for their increase in size as they rise). Cover and leave to rise for about an hour and a half, or until risen by half. Bake at 220 degrees C for 10-15 minutes, until just brown on top. Trust your eyes and nose, but maybe set a timer as well, just to be safe . . .
As for leaving something in e oven, more like leaving someone on the stove. On high heat. When I was supposed to simmer it on low. Yeah. It was scary, but salvageable. I couldn’t bake without a kitchen timer – I always underestimate how long I’ll need but I’m far far too likely to wander off and start looking at twitter and then the next thing I know, I’ll smell burning. The extra cooking time doesn’t seem to have harmed your burger buns though, they still look delicious! My worst ever baking catastrophe was when I overshot my balance flipping a tarte tatin from a heavy pan onto a heavier plate and it slid down my arm. Molten caramel burns are NO FUN. I’m sure I’ve had lesser baking faux pas (I seem to remember there was an issue involving a cottage cheese bread in college) but those all pale beside the tarte tatin. These buns are super cute! And I’m very curious about your various mince mixes. Uhm, I’ve had a few baking disasters. The worst one was when I baked a Sally Lunn I posted about. I consider it the worst because I still have no idea what went wrong and that is what still drives me crazy. Three quarters of the bun baked perfectly and half of it remained in a semi-liquid form. At least when you burn something you know who the culprit its… I like it when bloggers admit to not always making things that are picture perfect because as we all know, that is never the case. So good job for posting this and it sounds like you accidentally discovered a good way to make buns: sometimes, when they are too airy, they fall apart if they contain a large burger. So here is to a crunchier outside! Laura – thank you. Yep, I agree – homemade burgers AND buns all the way. Kathryn – haha, I’ve learned the hard way – a timer is your friend! Susan – ouch! Caramel burns are seriously bad news. Glad you like the buns and yes, the different fillings make them so much more fun and pretty easy to prepare if you set out a few different bowls. Nuts About Food – it’s so infuriating when you can’t work out why something went wrong! But everyone has these disasters from time to time and I totally agree, it’s nice when bloggers are honest about their mistakes. They still look lovely. And yes, I agree with Nuts About Food, sometimes you need a sturdier burger bun, so there are worse faux pas to make! Such dedication making your own burgers AND buns at same time! You know when I was growing up in the Midlands we would have called these “crusty cobs”. Every supermarket had a plastic cylindrical tube with a hatch at the bottom to serve yourself a bread roll from and they really were rock hard so that shards of bread dug into the roof of your mouth with every bite. Sounds vile but we thought nothing of it at the time. I’m sure in comparison your rolls were positively sponge like! I think they look fabulous! As does the whole sandwich! Yum! 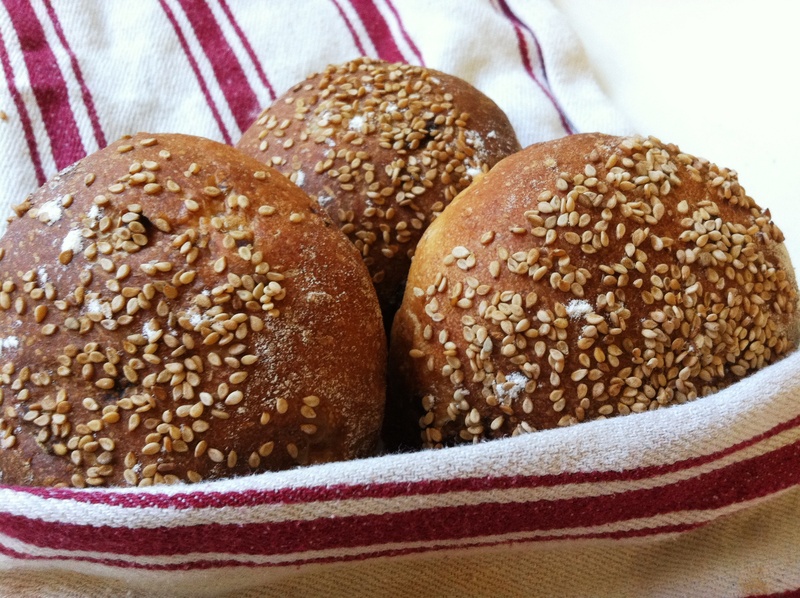 I have yet to make burger or sandwich buns but maybe I’ll borrow this Dan Lepard recipe. Delicious. And after a couple of disasters (a focaccia so burnt it left an acrid, bitter, smarting smell in the apartment literally for weeks!) I now stay in the kitchen and next to the oven whenever I bake! I just need my colleague to bring me honey and this is the first thing I’ll use it for!! Love the story about the little hot crossed bun who got lost in the oven – may he rest in peace. 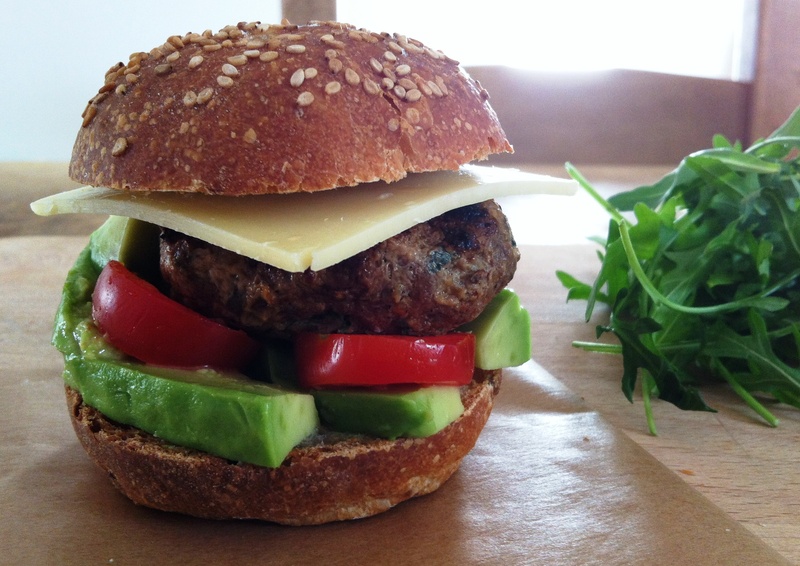 Also, Love the addition of avocado to your burger – one of my all time favourite toppings – yummy. While He Was Out – do it! i fell asleep and left a cake in the oven for 6 hours. i woke up at 6 when the fire alarm went off to find a ring of charcoal. doh. these rolls look pretty good though. 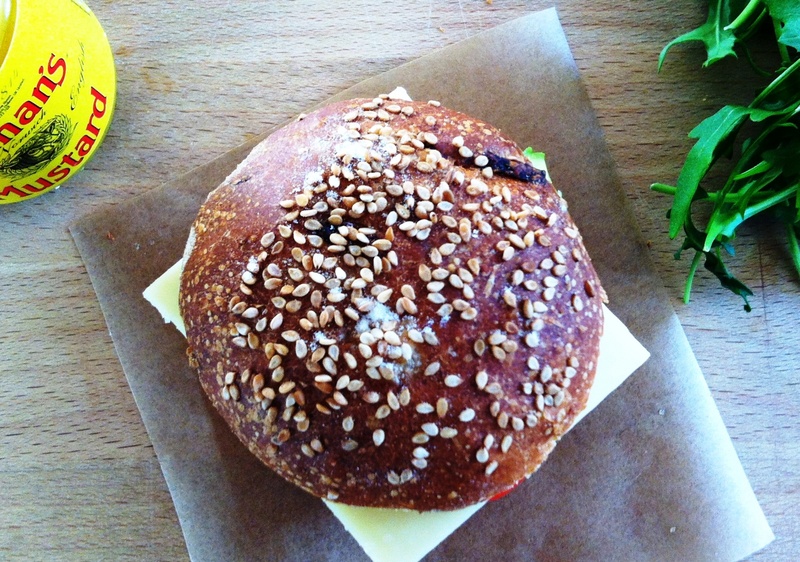 have you got a recipe for a brioche burger bun by any chance; thats my fav. Great hot cross bun story. Your buns look good, as does your finished burger. What I’m wondering (as a vegetarian) though, is HOW you get it into your mouth? 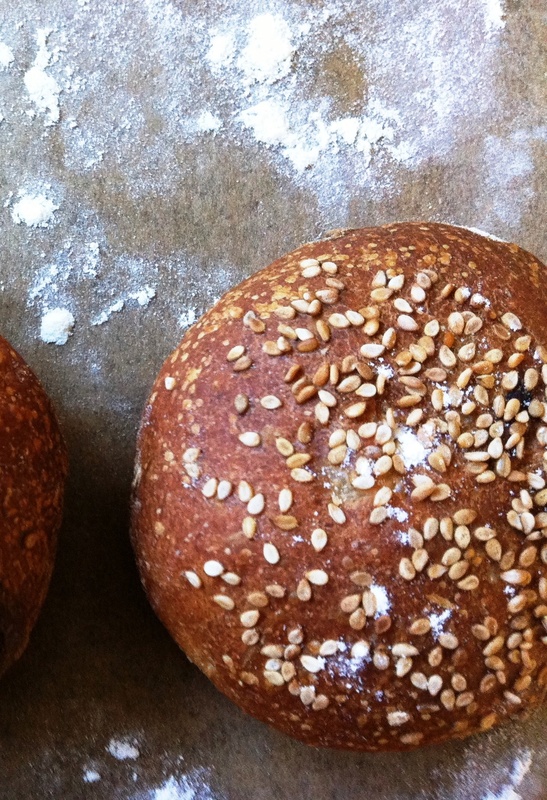 I find bread really forgiving – it’s quite hard to dry a loaf or roll out all the way through. But I use my timer – mostly because I’ve only got a tiny kitchen so don’t tend to hang around in it unless I am cooking or washing up. My mother has an aga and invariably burns things to charcoal. Once in the oven, you can’t really smell anything and even though she’s always had a timer, I don’t know what she does with it! These buns look pretty perfect for something that was left in the oven too long – my baking disasters have turned out a lot more charred let me tell you! 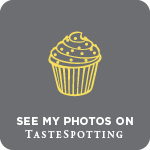 Anna – thank you – I think the lamb ones were my favourites! Cara – haha thank you, I think I had a lucky escape! I once left some muffins which take 18 minutes in the oven for an hour before remembering. They were black and totally inedible, unfortunately!